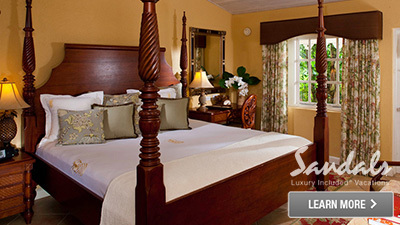 Experience the most luxurious stay in Antigua. 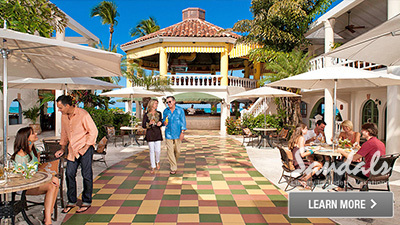 Sandals Antigua will allow you to experience the most ideal tropical vacation destination. 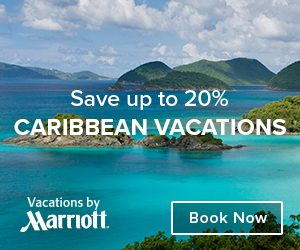 You can even discover the Caribbean when you stay in this all inclusive resort. 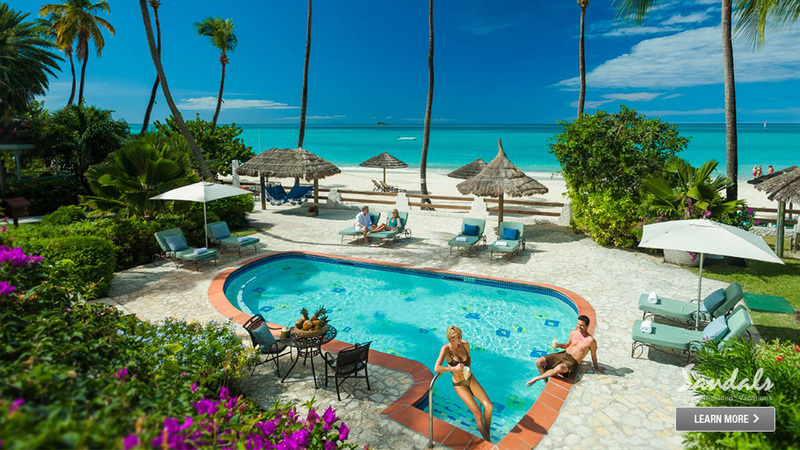 Set on Antigua’s best beach, this adult only resort is also the perfect spot for couples who want to spend quality time together. Since this is voted as one of the most romantic resorts, couples will surely enjoy intimate moments of togetherness wherein they can also enjoy great exclusivity and privacy. 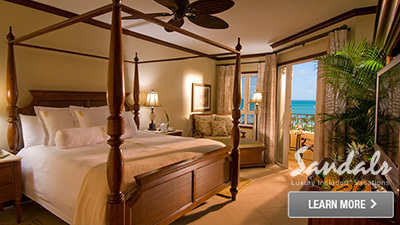 There are various room accommodations available at Sandals Antigua. 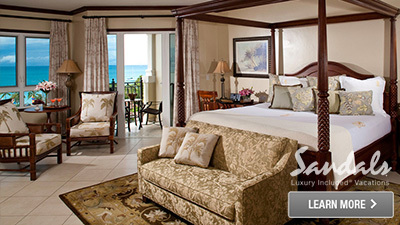 Travelers and couples can choose from deluxe rooms, poolside rooms, private suits, beachfront rooms and much more. 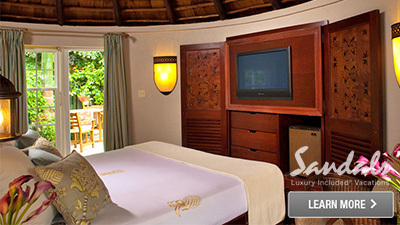 All rooms are fully equipped and air conditioned. 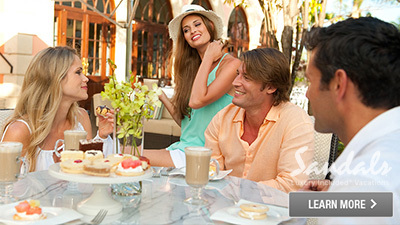 They also have private furnished patios and balconies. Modern and reliable internet access keeps individuals connected. 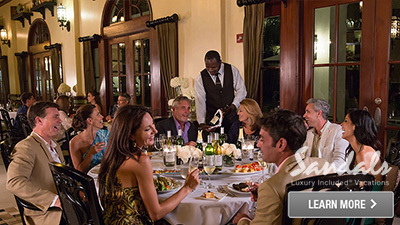 Wi-Fi and cable programming is readily available for the ultimate entertainment of guests. Not enough yet? 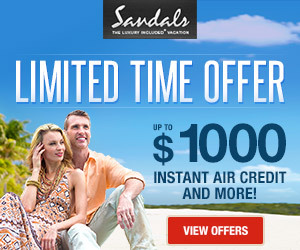 Take advantage of the amazing all inclusive options at Sandals Antigua. 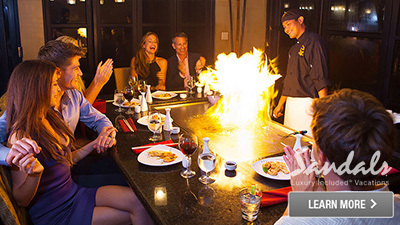 They range from unlimited dining at it’s eleven specialty restaurants to quenching yourself at seven bars serving unlimited premium liquors. Looking for fun things to do? 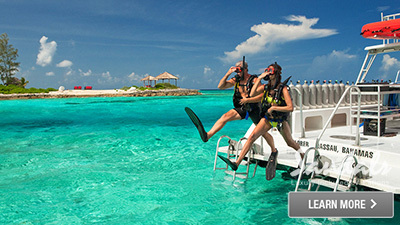 Unlimited land and water sports and deep sea scuba diving will quench that particular need. Last but not least, they have a top rated butler service included in top-tier suites and a dynamic six-star, all-suite Mediterranean Village. 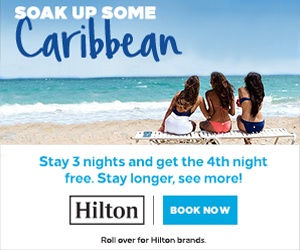 Come relax on silky-soft, pure white sands and let the warmth of the Caribbean fill your senses. Create your own lover’s legend as you share the most romantic holiday of a lifetime. Two perfect worlds. 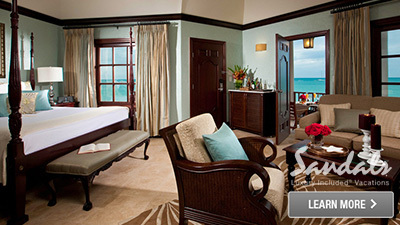 One grand resort at Sandals Antigua. 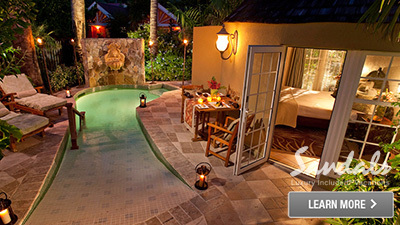 Each villa has an expansive pool deck which leads to the plunge pool & whirlpool. The living room is furnished with a sofa, a love seat and a writing desk. 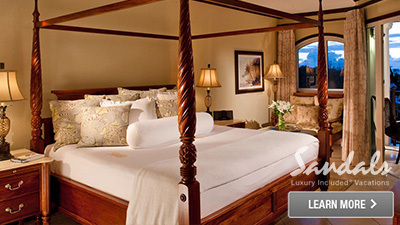 The bedroom is furnished with a king sized four poster canopied bed. The bathroom also has twin wash basins, a roman whirlpool tub and a “rain” shower. 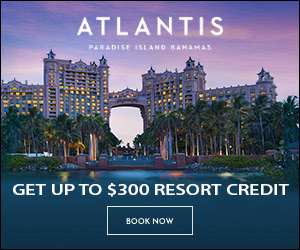 Steps away from the beach, these exotic suites are in individual circular buildings with cone-shaped roofs, featuring patios, private plunge pools, mahogany beds, and 24-hour room service. 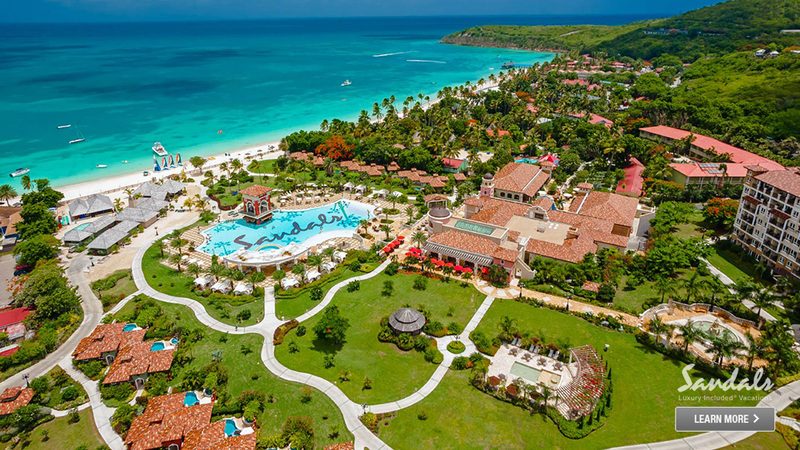 They have the same unique accommodations as Luxury Beachfront Rondovals, but with view of manicured gardens instead of the ocean. These penthouse vistas offer incredible views of Dickenson Bay. The living room and bedroom both lead out to an oversized balcony. The living room is furnished with a sofa, chaise and writing desk. 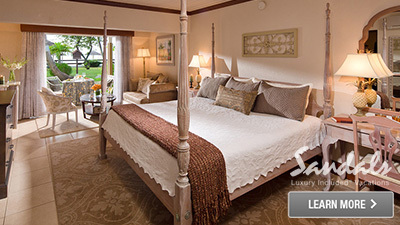 The bedroom has a king-sized, four poster canopied bed. The bathroom has twin wash basins, a Roman whirlpool tub and a “rain” shower. 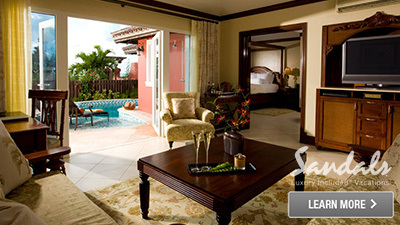 These suites offer panoramic views of Dickenson Bay. The living room and bedroom both lead out to an oversized balcony. The living room is furnished with a sofa, chaise and a writing desk. 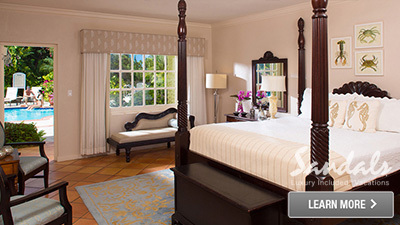 The bedroom has a King-sized, four poster canopied bed. The bathroom has twin wash basins, a roman whirlpool tub and a “rain” shower. Expansive suite with bedroom and living area. All suites have a balcony or a patio. 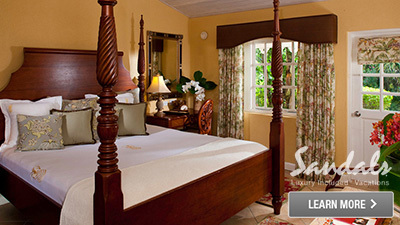 Suite is furnished with mahogany four poster king size bed. Newly refurbished bathroom features two marble wash basins, whirlpool tub and overhead “rain” shower. 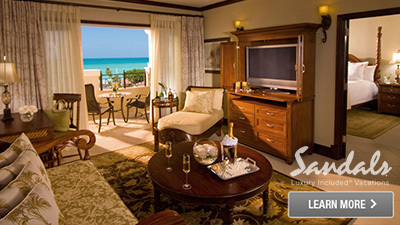 Suite has a large flat screen plasma TV, 24-hour room service and spectacular ocean view. Newly refurbished room with elegant pickled and mahogany furnishings and a four poster king size bed with large flat screen TV. Bathroom features marble vanity and hand held luxury shower head. 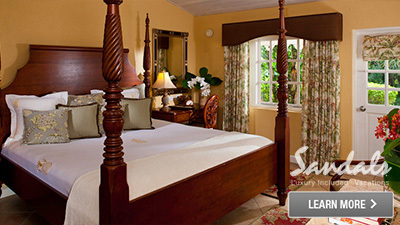 Beautifully designed room with elegant mahogany furnishings and a four-poster king size bed with a large flat screen TV. Bathroom features marble vanity, and hand held luxury shower head. 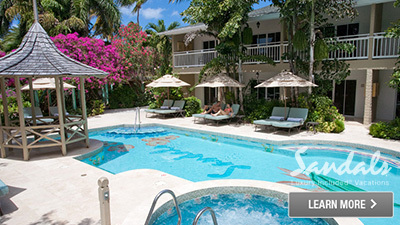 Rooms are located on the first floor of the Frangipani Block and you can just walkout to the pool and beach. Newly refurbished room with pickled and mahogany furnishings. 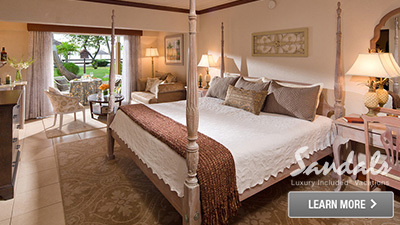 Comes with a four-poster king size bed with a large flat screen television. Bathroom features marble vanity, and hand held luxury shower head. Two-story Frangipani Block facing ocean and beach. 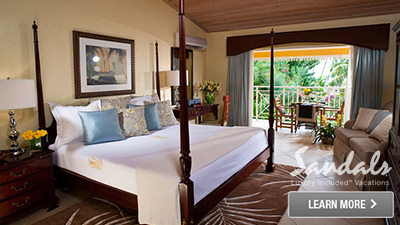 All rooms feature mahogany furniture with patio or balcony overlooking intimate pool area. 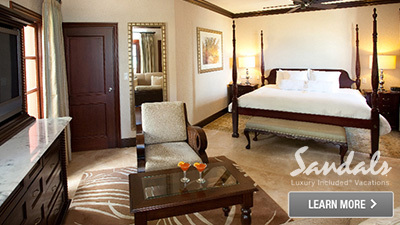 Experience the ultimate indulgence as you lay claim to this palatial, extraordinarily spacious, 625-square-foot suite. It features custom-made mahogany furnishings; a plush king-size, four poster bed with Egyptian cotton bedding and mosaic bathrooms with his and her vanities, a whirlpool tub and a separate walk-in shower. 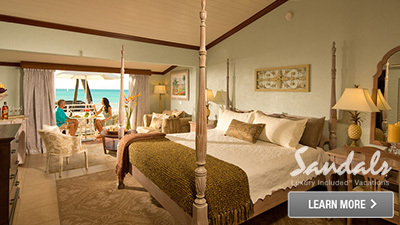 A large suite that features a large bathroom with a whirlpool tub, separate shower and two wash basins, a four-poster bed and a sitting area with a desk. An inviting sofa facing a large flat screen TV. They are located on the 4th and 5th floors of the Cypress Tower building and on the 3rd floor of the Almond building. 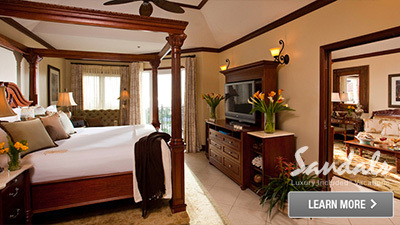 This suite is furnished with a sofa, a writing desk and a four-poster, king-sized bed. The bathroom has twin wash basins, a whirlpool tub and a separate walk-in overhead rain shower. 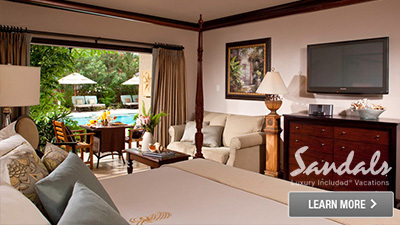 The suite is fitted with a large, flat-screen TV and has a patio which opens up to the lush gardens. 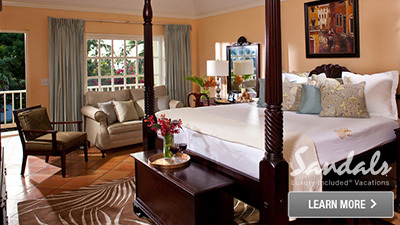 This suite is furnished with a sofa, a writing desk and a four-poster, king-sized bed. The bathroom has twin washbasins, a whirlpool tub and separate walk-in overhead “rain” shower. The suite is fitted with a large, flat-screen TV (42″) and has a balcony or patio. There are two suites in this category fitted for wheelchair access. 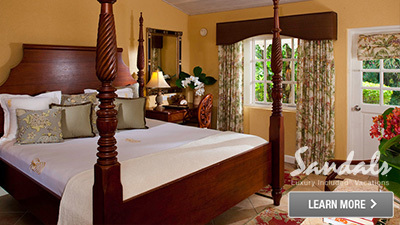 Large rooms include bedroom with a four poster mahogany bed and sitting area. All rooms come with a balcony. 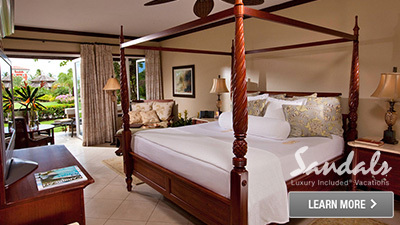 Centrally located within the Caribbean Grove, the gorgeous Honeymoon Grande Luxe Room features a four-poster king size bed with a separate seating area. 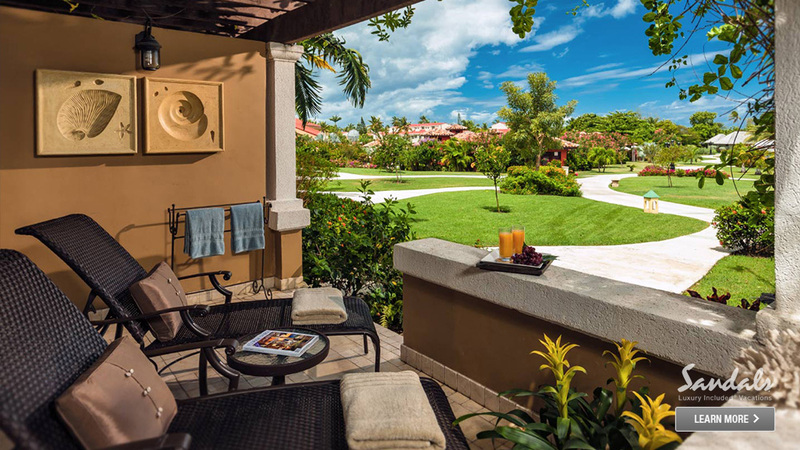 A balcony or patio just steps from a secluded pool and tranquil gardens. Set in Flamboyant and Oleander Blocks. 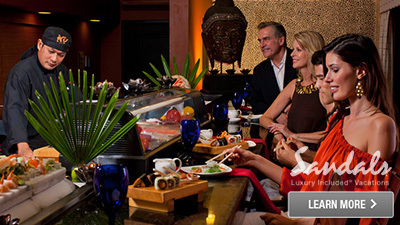 The ideal pathway to mind-body rejuvenation begins at the Red Lane® Spa. 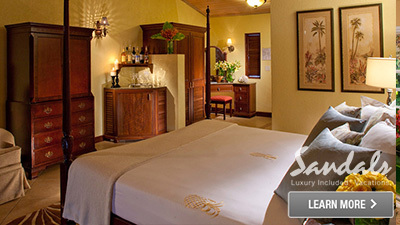 Loosen up with their West Indian massage, or try body exfoliation with pure island sand. 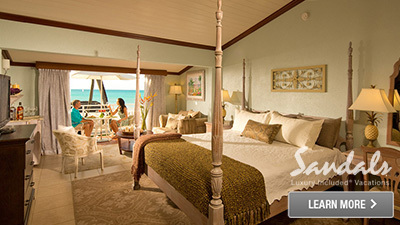 Reserve a massage on the beach or in the privacy of your room. Relax with a mud mask, unwind with a margarita and manicure at their spa boutique or do an entire beauty makeover. It’s all about you and it’s about time–now that you have it. 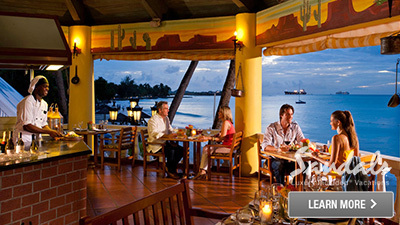 The best way to experience the real Antigua is to get up close and personal with it. Island Routes offers luxury adventure tours that range from completely exhilarating to delightfully sedate. No matter what your speed, you’ll gain authentic insider insights and a whole new perspective on this beautiful island paradise considered to be one of the most unspoiled and romantic destinations in the world. 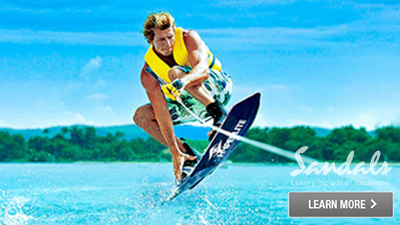 The featured tours include ATV Adventure Tour and the Island Safari Out Back from West Coast. 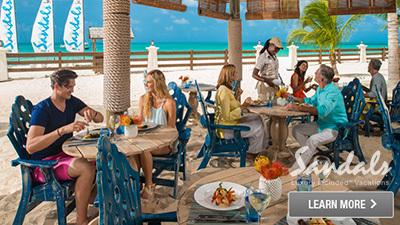 Reserve a pool or beachside cabana and allow a personal attendant to fulfill your wishes. Breakfast, lunch and a fresh fruit platter arrive at your shaded lounger, an ice cooler keeps your champagne chilled while a mist generator ensures your constant comfort. Discover the Lombardia Region of Italy. Mario’s draws its cooking style from the beautiful region of Tuscany, Italy. With dishes inspired from Milano, guests can find some of the most authentic Italian food in the world here, including the signature dish, Osso Buco alla Milanese (Braised Veal Shank with Saffron Risotto). 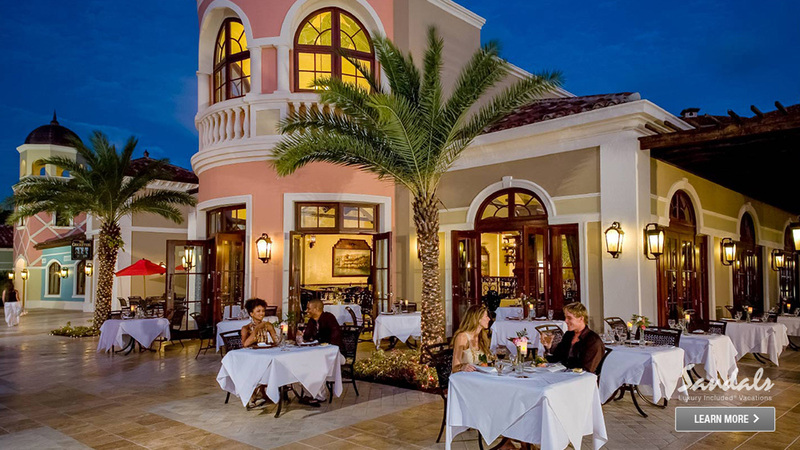 Everyone who steps foot in this inviting trattoria will enjoy a little bit of Italy in the Caribbean with Mario’s old-world décor and authentic, Italian recipes. 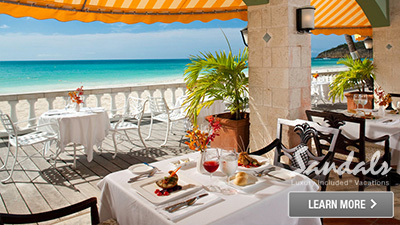 Representing the best in the rich, flavorful fare that the Caribbean is known for, come to Eleanors to relax and enjoy the beauty of the ocean vistas. Savor traditional favorites with a Caribbean twist such as grilled rib eye dusted with Blue Mountain Coffee, drizzled with dark rum jus, and topped with a spicy jerk shrimp skewer. PawPaw (papaya) créme brûlée is among the desserts to die for. Wonderful wine and good spirits perfectly compliment the good times to be had there. Drunken Duck is home to a rustic, saloon like décor and lively bartenders. It is a great place to completely relax and enjoy customary pub fare. Offered are Shepherd’s Pie, Fish and Chips with homemade tartar sauce, Bangers and Mash. This scrumptious pub food can be paired with a wide range of beers, wines, spirits and soft drinks. A delightful encounter full of good times and customary pub fare awaits pub-goers who seek the welcoming experience of a traditional, British pub. OK Corral is most known for its happy-go-lucky environment and southern-style recipes. Those who’ve tasted the cuisine of OK Corral, and seen the cacti and desert landscapes hand-painted on the walls, find this restaurant to be a true expression of the the American Southwest. With one of the best Red Bean Chili Soups west of El Paso, and tasty steaks prepared in the spirit of the true south, you’ll find every main dish is served with corn on the cob, baked potato, coleslaw and baked beans. 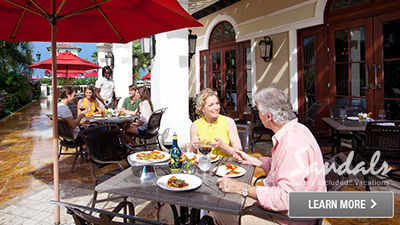 Courtyard Bistro accentuates Antigua’s lush surroundings as guests from all over come to take pleasure in the full-of-life charm and savory favorites offered by this enchanting bistro. This beachfront paradise features charming mosaic-style bistro tables and a bustling bar with a backdrop of spectacular vistas. International and island delights such as hot dogs, French fries, sandwiches, fruit plates, salads, burgers and patties embody the true spirit of the islands. Parisian-style patisserie with pastries, crêpe, coffee and tea. Café de Paris is giving it a reputation for fine, Parisian treats. Delight in French favorites, like chocolate cream puffs, crème brûlée tarts, cake, cookies and more, from morning well into the afternoon. 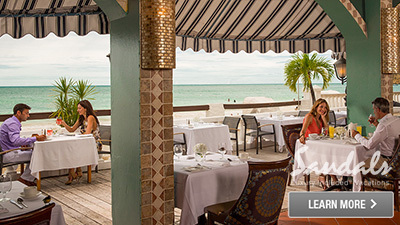 Café de Paris combines the laid-back Caribbean spirit with a smidgen of France’s romantic, sweet life to bring some delicious joie de vivre to the islands. 1. GOLFING — Take a break and unwind on the green during a leisurely game of 18 hold golf on any of the beautiful and challenging greens. 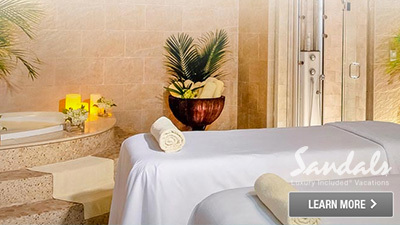 After golf, take a trip to the spa for a couples massage or other top of the line invigorating spa treatments. Be sure to stop for a visit at Cedar Valley Golf Club. 2. CASINOS — Kings Casino is small and quaint but will provide you with the thrill of slot machines and other casino games. 3. GREAT BIRD ISLAND — If you have any type of interest in birds and wildlife then a trip to Great Bird Island would have to be on the list. Besides seeing the local birds, you will experience the other wildlife that call this island home and take in some natural beauty. 4. OFF ROAD TOURS — Take a thrill ride on a 4WD, ATV, or other off road vehicle and explore the area in a new way. The thrill and adrenaline rush from the ride plus the sheer beauty from the area will leave you in a state of bliss for the rest of the day. 5. 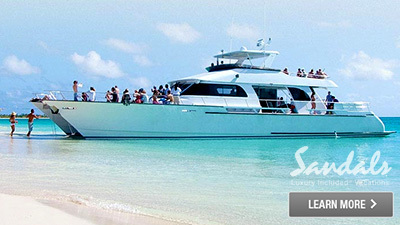 BOAT TOURS — Take a day and relax as you sail along the crystal blue ocean on any one of the boat tours offered. 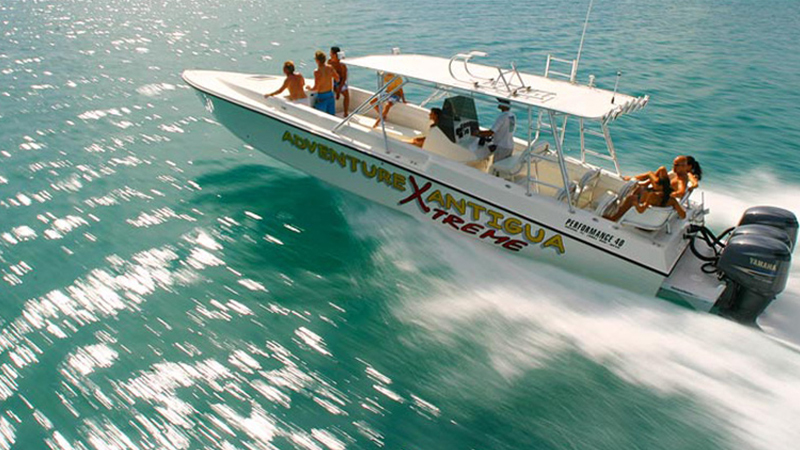 Adventure Antigua, dolphin watch boat tours, or for the more adventurous: the D-Boat tours are a few of the more popular options. 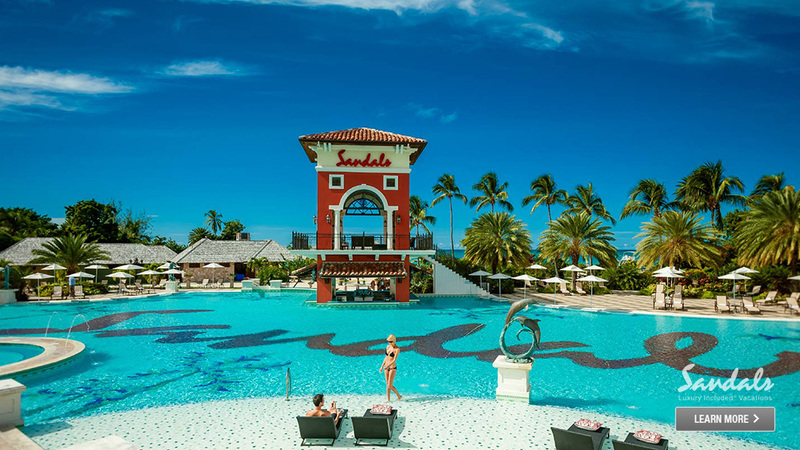 Voted the “World’s Most Romantic Resort” year after year, Sandals Antigua is an all inclusive resort that is dedicated to creating a memorable, romantic getaway. You could easily get lost in the 27 acres of large lush gardens and along the pathways winding between buildings.